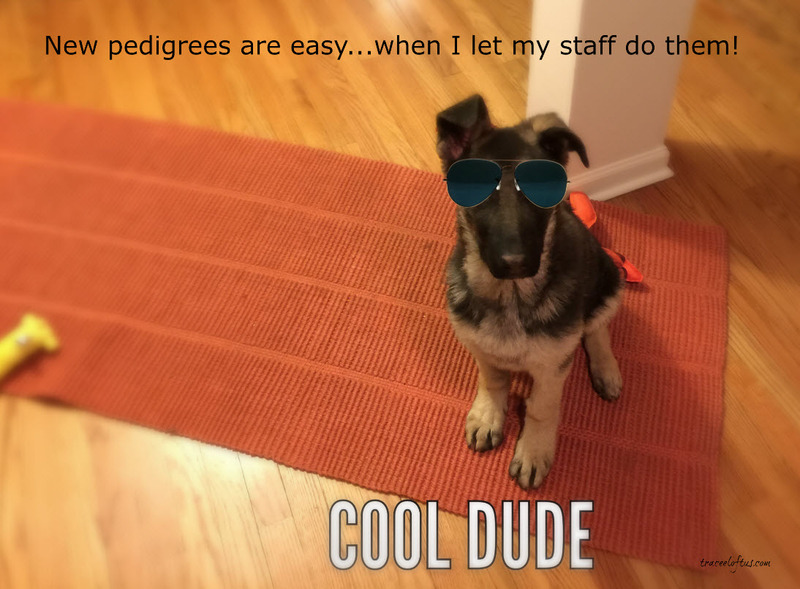 Does Needing A New Pedigree Have You Feeling Like Cool Dude? In need of a new pedigree for your AWESOME up-and-coming star? Would you like it to be available for print from a website? Turn over the task of creating new pedigrees and keeping them available over the internet to us. Send your complete pedigree, your halfway completed pedigree or your notes on the back of an envelope to us and we’ll get one put together for you. No problem! We’ll take this task off your hands…and your ‘to do’ list! It is best if you have something more than hand written notes and ‘call name’ of dogs – we will get your professional pedigree including kennel names (where we can find them) and other important stuff (like CH, GV, ROM, etc.) done in a jiffy. You too can be as cool as Cool Dude! Sample: Click here for sample pedigree. Pedigree can be available either password protected (only the user with the password can access) or accessible to anyone, including searchable by Google and other search engines. If you want a picture on the pedigree will add $4.95 to initial charge for setup. Then $4.95 per month (minimum two months). ****special**** $4.95 per month (minimum two months) – price guaranteed not to increase for each one purchased on this special by 5/31/17. Cancel anytime with 30 days written/emailed notice. Website for your Dog – starting at $299 set-up and $24/year to keep active and available online. Note: If you send me a picture for use, you are informing me you have permission to use that image. We cannot use ‘proofs’ or other images indicating they were not purchased or that someone else may have the copyright license. If you do not have a digital file, contact us and we may be able to arrange to scan your hard copy image for use on your pedigree and/or website. Our company website (bipplan.com) will appear on the bottom of the pedigree and/or website with link to our site or you can pay a one-time charge to have this removed. Also Note: You will do the final proofing of the pedigree. We can type and format like crazy, but sometimes, we will not be able to ensure everything is EXACTLY correct. We would hate to leave off a CH or misspell a kennel name. We will need your final review and sign-off verifying all is correct.